and then just click your way through it… I have set the links to open the story in new tabs. I thanked her and told her that we had traveled to Mexico before. True, I was a little apprehensive about some things – traffic, finding good places to park our small motorhome, traveling on a pretty modest budget, and so on. But mainly I was excited about going back to a place where I find it so easy to live fully from my heart. Most of the Mexicans do it, and it rubs off on me. I love it. I love passing strangers on the street and exchanging greetings. I love the ready smiles, the courtesy, the friendliness, the encouragement that meets any attempt to speak Spanish. Just being in Mexico, experiencing the beauty and the climate, the people and the history, the food and the handicrafts, fills my days with enjoyment – as well as with some interesting challenges. Sharing thousands of miles of border with the United States, Mexico could not be easier to get to. Many thousands of Americans and Canadians travel to Mexico every year, and well over half a million live there. But I am surprised that there aren’t even more Americans there. One reason is probably not knowing what to expect. Rumors of bandits and drug lords may keep some out of Mexico, though such people are hardly unknown north of the Rio Grande. Many Americans who live in Mexico say that they feel safer there than in the United States. People are often concerned about illness; there are precautions to be taken there too, and even with those, some illness may occur. I can’t count the number of times in all my trips that I’ve had the turistas, even being quite careful. But I don’t want to miss out on things I want to do; I would rather take a few modest risks in the doing of them. And, as it turned out, I didn’t get sick this time. This book is meant to give you an idea of what travel in Mexico is like, though it certainly can be done very differently from our trip. The book will also – inevitably – show you Mexico through my eyes. As you will see, my husband Kelly and I have different interests than what the guidebooks usually discuss. 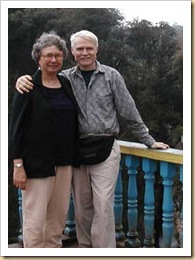 We have each traveled in Mexico several times. I spent the summer of 1952, when I was nine years old, with my father, stepmother, and sister in the Yucatan, Mexico City, Acapulco, and points in between. My stepmother got typhoid and amoebic dysentery, one right after the other. She nearly died. It was an intense trip which made me forever aware that I was among the privileged of the world when it came to material things. Kelly and I made our first trip there together in 1972, when we drove from El Paso to Durango and Mazatlan and back north to California. Our longest trip was in 1979, when we traveled through many parts of Mexico for three months, with a month in Guatemala, in a remodeled Ford camping van. That trip gave us a tremendous love for Mexico, but then we got busy with careers and life. We didn’t get back until 1992, when we flew to Guadalajara and took a bus to Guanajuato. That was a working trip. We produced a couple of videos, Student Life in Mexico and Mexican Pizza: Lively Conversations in Spanish.